Myopia in children and adults is a complex subject, both by its origin and by its evolution. We will try to clear up all the notions which relate to myopia. 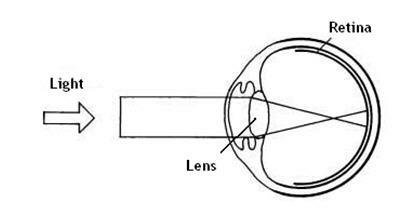 In a simplistic way, in a nearsighted eye, rays of light are going to focus in front of the retina, which causes blurred vision at distance (far away). The crystalline lens stopped thinning, flattening, and losing power within ±1 year of onset in children who became myopic compared with those who did not become myopes. Myopia onset is characterized by an abrupt loss of compensatory changes in the crystalline lens that continue in emmetropes (non myopes) throughout childhood axial elongation. The mechanism responsible for this decoupling remains speculative but might include restricted equatorial growth from internal mechanical factors. There are two theories: the genetic theory and the environmental theory. The genetic theory asserts that people become nearsighted because it is registered in their genes and that there is no relationship between nearsightedness and the use of the eyes… The familial incidence, according to this theory, persuades that children who have nearsighted relatives (father and mother) will have no other choice than to become, them too, nearsighted. The environmental theory asserts that besides children that are born nearsighted (often they show a very important nearsightedness), nearsightedness is a possible adaptation to “visual stress”: schooling, long hours to read, write and draw, long hours at a computer, at video games, reading and writing, too short reading, writing and computer distance, body posture while reading, etc. Several scientific studies show that when we compare two populations presenting homogeneous genetic characteristics (Amerindians, Inuit), the proportion of schooled people who become myopic is significantly more. Optometrists qualify this myopia as “school, stress-related or work-related myopia”. We can even assert that today, children become nearsighted younger and show a progression of their myopia that is more rapid than even twenty years ago! So, it is not surprising that the best readers are often myopic. Today, adults can also become myopic further to a new and important use of the eyes (working in front of a computer is a good example). We qualify this kind of nearsightedness as “late-onset adult myopia”. At the beginning of the century, it was said that the condition would stop progressing with puberty… but this is true but not «really» true. People at the time would stop going to school at a much younger age than today, stop reading and go work hard with their hands. 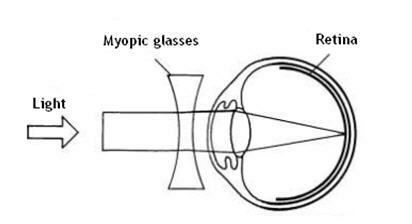 With all the visual requirements our eyes have to face, it often happens that myopia does not stop progressing. It is then necessary to act upon it. A small proportion of myopia is clearly familial, generally early in onset and of high level, with defined chromosomal localisations and in some cases, causal genetic mutations. However, in economically developed societies, most myopia appears during childhood, particularly during the school years. In addition, high heritability sets no limit to the potential for environmentally induced change. There is in fact strong evidence for rapid, environmentally induced change in the prevalence of myopia, associated with increased education and urbanisation. Environmental change appears to be the major factor increasing the prevalence of myopia around the world. Morgan I, Rose K. How genetic is school myopia? Prog Retin Eye Res. 2005 Jan;24(1):1-38. This should not convey the idea that the only correction possible are glasses or contact lenses to see at far and that there is nothing we can try to warn or control the progression of myopia. This is not really true.